Chichester girls’ under-13 Greens took on Cuckfield in a double header knowing four points from two games would secure the league title. The Greens started nervously and it was no surprise when Cuckfield took an early lead. Eventually the passes started to flow and two goals in two minutes for Charlie Davey was the reward. The second half was fairly comfortable for Chichester, but chances were missed. However, five minutes from full-time Ellen Middleton scored a superb goal from just outside the box to make the points safe. The second match started much better for Chichester, with Molly Stoddart scoring a superb solo goal after just 55 seconds. Midway through the first half Middleton rifled in another goal from outside the area and at 2-0 it was fairly comfortable. Cuckfield worked hard to get back into the match, but the Chichester defence were standing firm and Tatum Anwyl’s goal was rarely threatened. 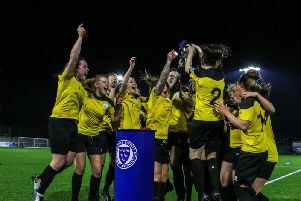 Evie Clarke rounded off a good all-round display with a fine goal two minutes from time, with the second game finishing 3-0 and Chichester having secured the points needed to win a richly-deserved league title.